This is an Electronic Appendix of documents to accompany my book Indians and Leftists in the Making of Ecuador’s Modern Indigenous Movements (Duke University Press, 2008). In June 1990, Indigenous peoples shocked Ecuadorian elites with a powerful uprising that paralyzed the country for a week. Militants insisted that the government address Indigenous demands for land ownership, education, and economic development. This uprising was a milestone in the history of Ecuador’s social justice movements, and it inspired popular organizing efforts across Latin America. While the insurrection seemed to come out of nowhere, Marc Becker demonstrates that it emerged out of years of organizing and developing strategies to advance Indigenous rights. In this richly documented account, he chronicles a long history of Indigenous political activism in Ecuador, from the creation of the first local agricultural syndicates in the 1920s through the galvanizing protests of 1990. In so doing, he reveals the central role of women in Indigenous movements and the history of productive collaborations between rural Indigenous activists and urban leftist intellectuals. Becker explains how rural laborers and urban activists worked together in Ecuador, merging ethnic and class-based struggles for social justice. Socialists were often the first to defend Indigenous languages, cultures, and social organizations. They introduced rural activists to new tactics, including demonstrations and strikes. Drawing on leftist influences, Indigenous peoples became adept at reacting to immediate, local forms of exploitation while at the same time addressing broader underlying structural inequities. 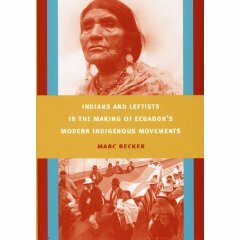 Through an examination of strike activity in the 1930s, the establishment of a national-level Ecuadorian Federation of Indians in 1944, and agitation for agrarian reform in the 1960s, Becker shows that the history of Indigenous mobilizations in Ecuador is longer and deeper than many contemporary observers have recognized.